Engineering celebrated some of its most outstanding faculty and alumni Thursday. 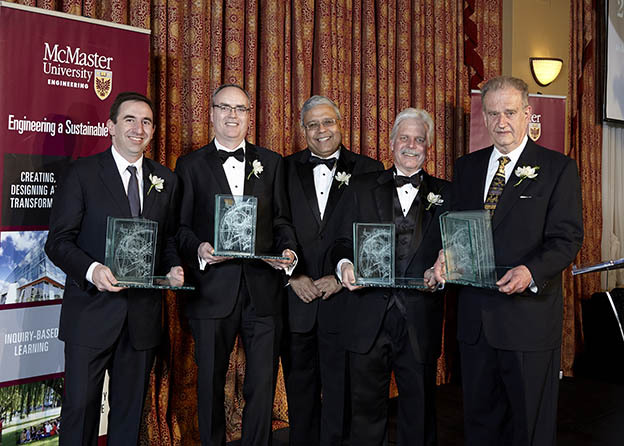 Michael Duhaime, Terry Fallis, John Bandler and Carlos Filipe were all recognized at the Faculty’s annual Applause and Accolades celebration. Duhaime, the global director responsible for electrified powertrain at Chrysler, was given the Faculty’s Leadership Award. Fallis, president of Thornley Fallis communications and author of several novels include The Best Laid Plans, earned the L.W. Shemilt Distinguished Engineering Alumni Award. Bandler, a professor emeritus of electrical and computer engineering, was the recipient of the Research Achievement Award. Filipe, an associate professor of chemical engineering, was given the Special Achievement Award for Teaching Excellence. Filipe was recently part of a team that developed a way to test water safety through a pill. The work has the potential to dramatically boost access to quick and affordable testing around the world. This year’s celebration was held at Hamilton’s LIUNA Station. Engineering celebrated some of its most outstanding faculty and alumni Thursday. Michael Duhaime, Terry Fallis, John Bandler and Carlos Filipe were all recognized at the Faculty’s annual Applause and Accolades celebration. Duhaime, the global director responsible for electrified powertrain at Chrysler, was given the Faculty’s Leadership Award. Fallis, president of Thornley Fallis communications and author of several novels include <i>The Best Laid Plans</i>, earned the L.W. Shemilt Distinguished Engineering Alumni Award. Bandler, a professor emeritus of electrical and computer engineering, was the recipient of the Research Achievement Award. Filipe, an associate professor of chemical engineering, was given the Special Achievement Award for Teaching Excellence. Filipe was recently part of a team that developed a way to test water safety through a pill. The work has the potential to dramatically boost access to quick and affordable testing around the world. This year’s celebration was held at Hamilton’s LIUNA Station.